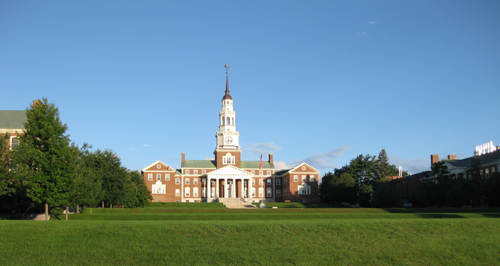 These brief essays from old timers tell us why they go to Colby every August. Tell us what you think either through our Facebook page or through the Contact page. Will I go? Of course. I find it easy to say what’s wonderful about Colby Great Books to another Great Books person. To tell someone who’s never participated in Great Books about it is another matter. Thinking about how to do this, I realized what fun I would have describing Colby to my bird-watcher friends and my marathon-runner/biker friends. My bird-watcher friends take time off from work and put aside other pleasures when the warblers come through. They train their binoculars on details of who is flying by, and who pauses to eat some dogwood berries or to drink at the bird bath. "Great Books at Colby College"
It's both where we go and what we do. That suits us because Colby College is both a great college and a great place. We've been there for sixty-four years so that's an indication we like each other. "Colby" creates a kaleidoscope of realities, a rainbow of different memories or connotations for those of us who travel to Colby College year after year with the books in our bags and their content in our minds. We hope you can join us at Colby this July. All our senses are already at the starting gate, ready to be transported to Colby where we do too many things to describe. After our last discussion of the week, with our bags packed, we gather on the lawn in the center of campus to sing a song. A farewell 'til next year. It's so corny Irving Berlin would cringe. But I've seen some pretty savvy intellectuals cry as we sing. Walk with me, talk with me, share with me your mind. Friendship, love, serenity . . . in your midst I find. Early Registration form is HERE! 2. If you seek a place to spend time with your brilliant child or grandchild . . .
1. If you want stimulating people sharing their ideas about the great issues and if you have been meaning to visit Maine for years and time away from TV and have a list of unread books you plan to read someday and you've been missing your walks in the woods holding hands with someone you love and want to watch the delighted squeal from little boys and girls learning new things and you haven't seen a chef with a tall white hat in years or ever and if you don't care where you are as much as about what you do and if you've been thinking there's more to a vacation than sitting on a beach or walking the deck of a cruise ship or spending your money in Vegas or flying for fourteen hours to sleep in a tiny room and eat overpriced food at a tiny table. We’ll meet you to share your ideas and laughter. To see Colby College special programs calendar online at the Colby website: Click Here. 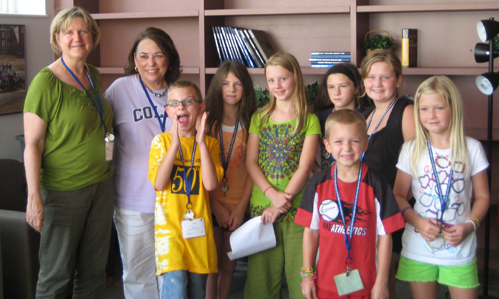 How is the Great Books camp for kids at Colby different from other camps? The way it integrates fun with learning. Camps are places where kids go to have fun and enjoy a change of scenery. But learning or honing skills is also a focus of most camps. Some camps are devoted to learning such as music camps, or art or athletic camps and more. The Great Books Camp for Kids helps children improve their ability to think critically, teaches them how to frame and ask questions, and exposes them to a higher level of interaction with their peers. The kids have fun in the process because the lessons are in the context of their group’s discussion of the stories they are reading. In every sense that's exactly what Great Books at Colby is about for adults. The key to that part of their experience is called "Shared Inquiry", a process as old as Socrates and as new as the most up to date learning environments today. You can read how that process works elsewhere on this site. In short, it's an activity that facilitates an exchange of ideas and different perspectives. Within the discussions of a book and the assessments of the stories, an individual of any age will learn from peers and their own shared experiences. And that's just plain fun because of the way it's done. The end of all this—just like the experiences of their parents, the children’s brains somehow feel expanded, ways of thinking are honed, and lifetime friendships may be created. Great Books Camp for Kids at Colby affords unique moments of personal growth that can be recreated year after year on the campus of a lovely college in Maine. Come join us. And bring the kids. What really is the story behind the Great Books Colby Camp for Kids? What’s going on for those boys and girls when they show up at Waterville in the first full week in August? As parents and grandparents we know how brilliant and malleable young minds can be. We see kids at Colby operating at higher and higher levels through books that are both fun and challenging. That is exciting in and of itself but what is even more exciting is to see how much fun the Colby Kids Program can be for both the kids and us. Something different and amazing happened this past August. One of our regular attendees, a computer scientist, expert chess player and chess book author introduced the children to the game of chess. Some might call it a way of life rather than a game, but for our present purposes, it’s a game. To see the kids last summer, those bundles of brilliant energy take to the game the way they did was one of the highlights of the week. What happened? Those kids took their boards and pieces and began playing the game everywhere- on the green in front of the dorms, the Recreation Center lounge, the dining room, in alcoves scattered through the dorms. One of the books the children had been discussing, Through the Looking Glass by Lewis Carroll, used the imagery of chess, but now the content of that book was being embraced as an integrated experience. I had almost no idea of what to expect or what to do, but when I asked questions, the Great Books and the Colby people were very considerate. They explained and made me feel at ease. In the Junior group, we play games to get to know each other, which helps us to feel comfortable during the discussions. The discussions help me further understand the books. I always want the sessions to be quite fun and they are. I love the day I get my books in the mail and I am most excited to read this year’s books. The Shared Inquiry method of Great Books weaves this together for all our Colby Kids. Children—and adults—learn and experience from each other during and after every book discussion. It is fair to ask what is the chief goal for any child who attends this program? We expect the child out of his/her prior school experience to have assimilated a somewhat passive learning style, to understand what the teacher has presented as a concept or idea in the classroom. What the Colby Junior program offers is something more, the opportunity to become a teacher too—to exchange ideas with peers and others. Through this back and forth process a child can learn to listen to what the others are saying and how hers or his ideas might best be understood by others. Reading widely then becomes a technical skill to be appreciated for the autonomy it confers on you now and for a lifetime.